Burge wants it to move everyone else, too. One Sunday, after treating his listeners to soulful slow movements by Mahler, Rachmaninoff and others, he turns to someone less familiar. “Here’s an interesting character,” Burge, 41, says. He introduces William Cornysh, a British composer, actor and poet from the early 1500s. Cornysh, it seems, once got himself thrown into prison, accused of slander. Knowing that the composer “was feisty,” Burge says, makes him enjoy Cornysh’s music even more. Then he plays a sample: a tender love song for male voices. That personal relationship to the music is what landed Burge his show. 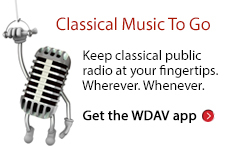 “I can see the potential for him for developing a following of his own,” says Ben Roe, WDAV’s general manager. Roe sums up why he gave a show to a radio neophyte. Burge’s salutation at the start of his show – “G’day!” – not only sets a cheery tone but, being the Australian national greeting, clues everyone in to his origin. Burge grew up in a suburb of Sydney. The school curriculum didn’t include instrumental music, Burge says, but the parents raised money for sessions outside the school day. When Burge was 7, the trombone caught his attention. It was very loud. Here’s how sold he is on the trombone. He sounds like he’s not entirely joking. But Burge’s WDAV show is built on the fact that his musical tastes go far beyond his own instrument. He credits that to an introduction-to-music class he took as a freshman at the conservatory in Sydney. The professor assigned several tapes’ worth of music – medieval to modern; Western and non-Western – for listening. The students had to be ready not only to identify each work from a few seconds of it, but to tell about its style and background. The more they knew, the better their grades would be. After finishing his conservatory training in Australia, Burge came to the United States to study at New York’s Juilliard School. Then, after a year with the Jacksonville Symphony in Florida, he moved to South Carolina in 1997 to play in the Charleston Symphony. There, as he later did in Charlotte, he found a job on the side. Actually, the job found him. Before a rehearsal, Burge recalls, he was warming up – a process that for him included singing parts of the music he was about to play. He had sung in choirs beginning as a boy, and he thought any instrument was more expressive when it could emulate the voice. This time, he was overheard by a church choir director. So Burge became the tenor soloist at Charleston’s First Scots Presbyterian Church. “It ended up being a great thing,” Burge says. He went on to sing solos in the likes of Handel’s “Messiah” and Bach’s “Christmas Oratorio.” And he keeps up the sideline nowadays. During pre-concert festivals before the Charlotte Symphony’s Scottish-themed concerts Jan. 14 and 15, he’ll sing Renaissance songs spotlighting the Highlands. In 1999, Burge returned to his homeland to teach at the Australian National University’s music school. Though he couldn’t have known at the time, his duties helped prime him for WDAV. Among other things, Burge says, he directed bands and other ensembles. To promote their concerts, he gave interviews to radio stations. Sometimes, the host might be a volunteer with little radio savvy, “and they’d just give me the floor for 30 or 40 minutes. “I had to be ready with information and to talk,” Burge says. From there to his own show was just one more step. But first, he returned to the United States in 2006 to join the Charlotte Symphony. As he settled into Charlotte, Burge found WDAV on his car radio. He noticed that the station spotlighted the area’s artists and arts groups, making itself part of the cultural scene. Burge also circulated around the actual community. Like most Charlotte Symphony players, he has fleshed out his salary by teaching. Early on, he taught band at Trinity Episcopal School. Now he has a part-time teaching job at Davidson College. Meanwhile, Burge met Roe and other WDAV staffers. When announcer Jennifer Foster took ill before a Charlotte Symphony broadcast, Burge recalls, she drafted him – since he was there anyway – to fill in with introductory chitchat. Burge went to Roe and program director Frank Dominguez last year and said he’d like to do a show. “We said, ‘You do, huh? '” Roe recalls, laughing. Hardly a week goes by, he explains, that he doesn’t hear that from somebody. This time, Roe was intrigued. He figured that someone who knew how to perform at concert time could probably do the same in front of a microphone. So he let Burge use studios during off hours to record tryout programs. After months of tips, tweaks and rehearsals, Burge went on air – live, not recorded – last July 4. Part of the show’s flavor comes from the unexpected. A November show, for instance, included a Richard Wagner opera prelude arranged for 15 cellos. But the personal touch that Roe had in mind comes out mainly in Burge’s reflections on the music he plays. Leading into a Mozart chamber work, Burge recalls that he used to play it in high school. He and two friends – whom he was “desperately in love with,” he says – formed a trio and played for tips on Sydney’s sidewalks. The three have remained friends, he says, and his onetime collaborators listen to his show online in Australia. So he sends them a greeting.